Sniper Elite 4 (game, 2017). A third-person tactical shooter stealth video game by Sold Out (retail)/Rebellion Developments Ltd. Developed by Rebellion Developments Ltd. Official Trailer. 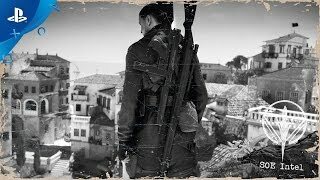 Sniper Elite 4 is a third-person tactical shooter stealth video game by Rebellion Developments Ltd and Sold Out (retail), developed by Rebellion Developments Ltd.
Sniper Elite 4 - "Italy 1943" Story Trailer | PS4. 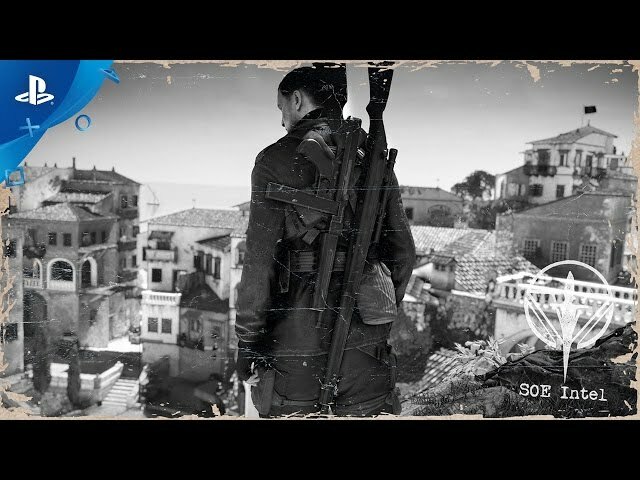 Sniper Elite 4 is set in Italy in 1943, in the immediate aftermath of the events in Sniper Elite III. Upon learning about rumors of a new Nazi weapon, the Royal Navy sends a freighter, the Orchidea to the island of San Celini to investigate. The ship is quickly sunk by the new weapon - a radio guided anti-ship missile under the development of scientist Andreas Kessler and Heinz Böhm, a high ranking Nazi general that the Allies have little information about. SOE sniper Karl Fairburne (Tom Clarke-Hill) is sent to the island after the sinking and tasked with assassinating General Tobias Schmidt along with several other officers who oversaw the attack, filming it to use as propaganda. After eliminating Schmidt, Fairburne is sent to the village of Bitanti by OSS agent Jack Weaver to find Sofia "Angel" Di Rocco, leader of the local Partisan resistance group. Distrustful of the OSS who allowed her father to be kidnapped by the Nazis, Angel enlists Fairburne to destroy a railway gun at Regelino Viaduct in order to prove himself and convince the group to join forces. After blowing up the viaduct and destroying the gun, Fairburne is sent to investigate a dockyard that the Nazis are using to ship the weapon part out of and call in a bombing raid to destroy the facility. Upon learning the Sicilian Mafia were helping disrupt operations at the dockyard to slow down the shipment of the weapon parts, Fairburne meets with kingpin Salavatore Dinelli who agrees to provide additional assistance after eliminating Piero Capo, leader of the local Black Brigade. Distrustful of the Mafia's intentions, the Partisans are reluctant to maintain the alliance. However when an SOE informant, Major Hans Dorfmann, reveals that Kessler is at the Maggazeno Facility where the missiles are assembled, Fairburne infiltrates the base to kidnap Kessler and steal his research notes. On interrogation, Kessler tells Angel her father is still alive, prompting the Partisans to depart to assault the town of Giovi Fiorini and find Böhm's confidant Major Klaus Rothbauer. Kessler then tells Fairburne that he is dying of liver cancer due to his heavy drinking and is of no use to the Nazis or the Allies as a result, and that the information given to Angel was a lie in order to lure the Partisans into a trap. Fairburne departs to Giovi Fiorini and eliminates Rothbauer, but the ensuing battle results in the Partisans being massacred. Sniper Elite 4 is a tactical shooter game with stealth elements, played from a third-person perspective. When the player kills an enemy using a sniper rifle from a long distance, the X-Ray kill cam system will activate, in which the game's camera follows the bullet from the sniper rifle to the target, and shows body parts, bones or internal body organs being broken or ruptured by the bullet. The system has also been expanded to include shrapnel kills, melee kills and stealth kills. Sniper Elite 4 was scheduled to be released by Sold Out (retail) and Rebellion Developments Ltd on February 13, 2017 and on February 14, 2017.